If it’s any consolation, I’m only one state away and I get to Arizona fairly often, so the chances for our paths to cross in the future are good. Sadly, I can’t make it to either event. Mark Hallett is one of my favorite artists of all time, and I would love to meet him in person. 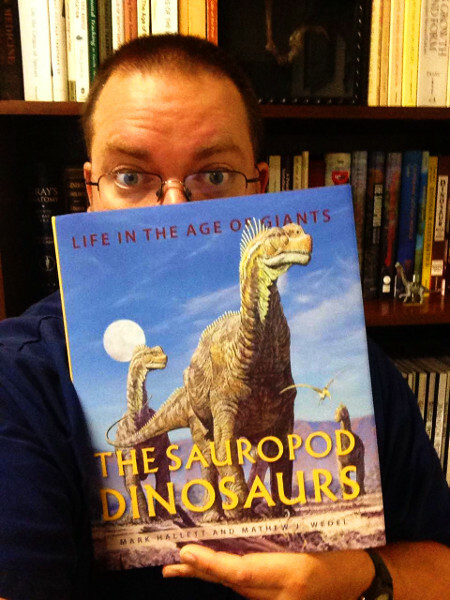 I purchased the sauropod book last year and absolutely loved it. A great general overview of sauropodomorph paleobiology, which introduced me to information I didn’t even know about (like the alleged Aguja Formation alamosaur coprolite). I especially appreciated Mark’s humble tribute to Dougal Dixon in his feathered Pamphagia painting. Not sure about some of the skeletal drawing, though; they look adapted from the ones in Greg Paul’s Pearson Guide, which are fraught with Petersian errors. Which is odd, because Mark usually does his own skeletals.